World Economic Forum Helps Vietnam Bill Itself as a Business Alternative to China - Integration Through Media ....! 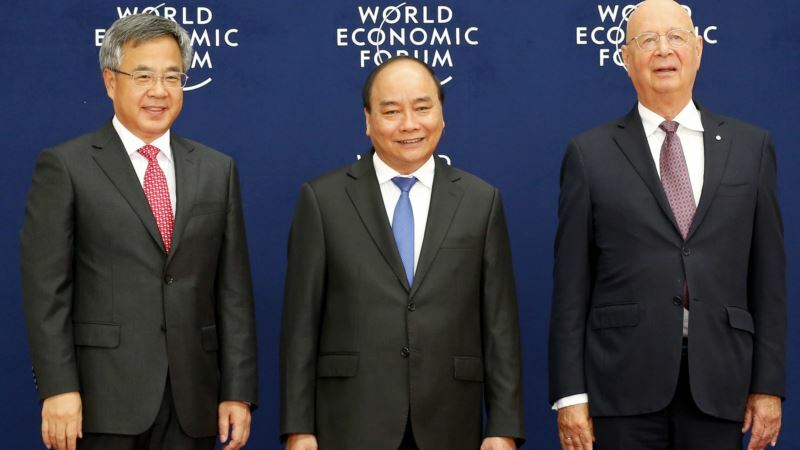 (VOA): Vietnam has a chance this week as World Economic Forum host to show curious foreign investors they can ship exports from the fast-growing country to China or the United States without the hazards of a widening Sino-U.S. trade dispute. The annual event from Tuesday through Thursday in Hanoi this week gives Vietnam access to multinational companies, some of whom have not visited for more than a decade, said Frederick Burke, partner with the law firm Baker McKenzie in Ho Chi Minh City. About 1,000 delegates were due to attend the event with a program focused on Vietnam's broader location, Southeast Asia. Vietnam looks to foreign investment in export manufacturing to keep its economy growing at 6-7 percent. It will probably impress on delegates this year that investors can ship goods to China as well as the United States without getting embroiled in the Sino-U.S. trade war, experts say. The World Economic Forum’s event in Vietnam, which includes leaders from Cambodia, Laos, Malaysia, Singapore, and Sri Lanka, Indonesia, the Philippines, and Myanmar, features discussions on aging populations, the Internet economy and high-tech agriculture. Some of the nine leaders in attendance are scheduled to speak during the sessions. The 47-year-old forum advocates government-private sector cooperation, and many see it as a pro-free trade organization today. But it’s the sidelines that will matter for Vietnam, analysts believe. Business people will see new infrastructure in the country and may learn about government incentives to bring in export manufacturers. “They’re really rolling out the red carpet for everybody…and trying to accommodate,” Burke said. Production in Vietnam costs less than in the traditional factory go-to country China, a selling point for the Vietnamese economy over the past 10 years. Vietnam may also use the forum to push for multi-country free trade agreements, said Carl Thayer, Southeast Asia-specialized emeritus professor at the University of New South Wales in Australia. Its call would counter U.S. President Donald Trump’s focus on bilateral deals instead. Vietnam hopes, for example, for finalization of an 11-member country Trans Pacific Partnership after its 12th member, the United States, withdrew from the trade deal last year. With a Sino-U.S. “trade war on the sidelines,” Vietnam will be able to gauge what other leaders think, Thayer said. They might worry, as Vietnam does, that the trade dispute will shake steel exports and hold back the digital economy, he said. The U.S. announced tariffs earlier this year on steel from much of the world. “Part of hosting these summits is designed to have everybody see Vietnam as a solid international good citizen that’s contributing to the good, and for its own interest as well,” Thayer said. Last month the United States imposed 25 percent tariffs on $16 billion worth of Chinese goods following the same rate on another $34 billion worth of products in July. Beijing responded in each case by raising tariffs by the same amount on U.S. imports. The U.S. government has vowed to increase tariffs further. Exporters that ship to the United States from Vietnam would save money compared to peers in China, with little risk to their cross-border supply chains, an associate with the business consultancy Dezan Shira & Associates in Ho Chi Minh City said earlier this year. Firms that ship from Vietnam to the United States now include Intel and Samsung Electronics. Chinese companies are keen to set up more factories in Vietnam, touching off protests in June over fears in the Southeast Asian country that they would get too much access to special economic zones. Vietnam counted the United States as its top single-country export destination last year, when it shipped $46.5 billion worth of goods to the U.S. market. Exports to the United States grew 12.5 percent in August, while exports to China expanded by 30 percent. Foreign investment last year contributed to exports worth $155.24 billion. Vietnam may be able to convince business people at the forum that it's ideal for intermediate goods such as electronics components, said Alicia Garcia Herrero, Asia Pacific chief economist with the French investment bank Natixis. She added Vietnam is “well placed” as a China alternative because it trades with both China and the United States. “If they play that card, I think they could do well,” she said. “This means more FDI into Vietnam, because people will realize that this is a good platform to get a least part of the China business in terms of value chain into the U.S., and I think this is very, very appealing to Vietnam,” Garcia said.